On May 22, yellow forsythias were in full bloom in the Manseok Park, Suwon. They were the members of the Intl. WeLoveU Foundation who gathered to give hope to the countries having a water shortage, victims suffering from natural disasters, and neighbors going through hard times of life. The Intl. WeLoveU Foundation held the “13th New Life Family Walkathon” under the auspices of the Ministry of Health and Welfare, city governments of Seoul and Suwon, and Sejong General Hospital in Bucheon. 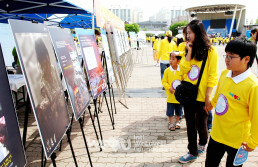 The New Life Family Walkathon that started to help children with heart disease and intractable diseases, and of parentless or extremely poor families, and foreign workers who injured has met its 13th anniversary. 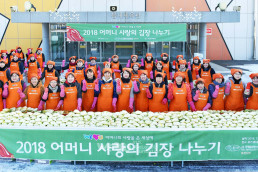 This year, the foundation donated 12 million won [10,000 USD] for 24 low-income households in Suwon including senior citizens living alone and parentless families, and 3.4 million yen [42,000 USD] for the relief effort for the Japanese earthquake victims. It also donated facilities to develop ground water and eight water pumps to four countries suffering from water shortage—Cambodia, Ghana, Kenya and Nepal (two water pumps each). 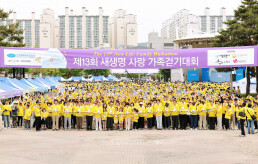 The walkathon was attended by 6,500 people including the citizens of Suwon as well as the WeLoveU members. People of all social standings also participated in this meaningful event: Margaret Clarke-Kwesie the Ambassador of Ghana to the Republic of Korea, embassy officials in Korea whose country received the water pumps from the WeLoveU Foundation, Ye Chang-geun the Deputy Mayor of Suwon, Lee Chan-yeol a member of the National Assembly, local government officials, actor Lee Sun-jae the Sponsor Chairman of the WeLoveU Foundation, and Kim Seong-hwan the goodwill ambassador of the WeLoveU Foundation. Before the walkathon, there was a celebration on the bandstand in the park. Chairwoman Zahng Gil-jah hoped that the walkathon gave an opportunity to look around our families and neighbors through “walking” that makes people get along with one another without competition and have a sincere talk so that they can be healthy both physically and spiritually. In her welcoming message, she also said that their footsteps would give great energy to our global neighbors who lost peace of mind, being driven to despair due to natural disasters. This day, the foundation delivered water pumps and donations. Ambassador of Ghana to the Republic of Korea, Margaret Clarke-Kwesie, expressed her thanks on behalf of all beneficiary countries including Ghana, saying, “Water pumps enabled many children in Ghana and citizens drink clean water and live healthy. 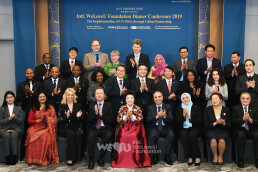 Your donating the water pumps is no different from giving us life.” Vice Mayor of Suwon, Ye Chang-geun, also said, “I’ve never heard about this kind of global scale event in these days. I’m thankful for your help for our unprivileged neighbors in Suwon, and I think this will be an opportunity to make the citizens realize the value of volunteering service and sharing.” He also hoped that the foundation’s love for humankind would be spreading throughout the world. The celebration was followed. The New Life Children’s Choir showed Taekwondo and dance, and the foreign families who stay in Korea sang a song of hope, singing, “You raise me up.” PR Ambassador Lee Seung-hun sang the song, “We love you,” of his own composition together with the members, and vocalists Kim Seong-hwan, Baek Mi-hyeon and Kim Jae-hun delivered the message of hope through their enthusiastic performances. 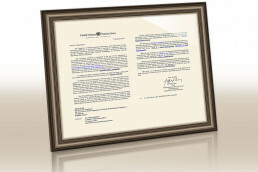 And subordinate events were prepared. It informed the participants of the importance of water by washing hands with 30 grams of water and water-saving quizzes. Along with the photo exhibition showing the damage of Japanese earthquake, they shared the pain of our global neighbors by writing messages of encouragement to the victims. 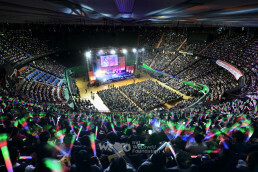 Various events such as “face painting” and “making button with family” were also prepared. Yellow waves created by the members were rolling along the lake. As the head of a procession finished the walkathon course and toched the tail, a yellow shape of heart was created—it was the gift of hope from the WeLoveU Foundation under the soft beans of sunlight in May.